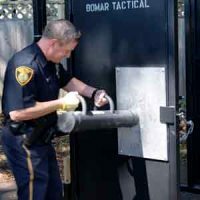 Bomar Tactical provides breaching equipment that has been designed and tested by SWAT Team Breachers. Our goal is to provide the most realistic training aids possible, at an affordable price that can meet todays budgets. 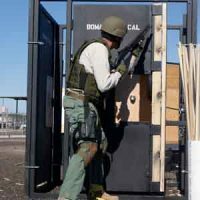 Bomar Tactical offers: Tactical Breaching Doors, "Det Strip" which is used for holding Det Cord for an explosive breach as well as our own Universal Target Stand. Please visit our website and view our photos and videos. Tactical gear from the experts! Bomar Tactical is known for providing the best possible Tactical Training to all Law Enforcement Officers, EMS and Security Professionals. The instructors are Police Officers and SWAT Team Members, who are highly trained in their fields and are dedicated to improving officer tactics and decision-making ability. Now, Bomar Tactical offers tactical gear and equipment as well as apparel for both on the job and off! Browse our wide selection of products, each specifically chosen by experienced Law Enforcement and Military Personnel who believe in the tactical gear we offer, most of which have been field tested and approved.